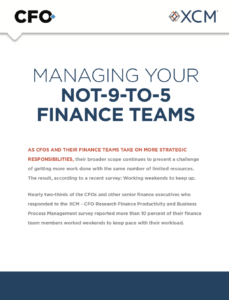 As CFOs and their finance teams take on more strategic responsibilities, their broader scope continues to present a challenge of getting more work done with the same number of limited resources. The result, according to a recent survey: Working weekends to keep up. Download this research report on how working weekends may be an indication of workflow issues.